Big Kick is the ultimate plugin for creating incredible kick samples for your tracks, saving you time and helping you craft the perfect kick sound. BigKick gets rid of the frustration and makes kick drum design easy and enjoyable. With simple drag-and-drop controls, working with the plugin is incredibly easy. Instantly import your own samples into Big Kick or choose to use one of the hundreds of pre-made kicks, then tweak to your own taste. Drag finished samples straight out of the plugin to your host’s sampler. 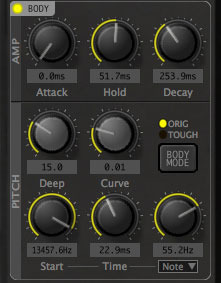 Or drag sounds straight from your track onto the Load Sample button to layer them with the synthesized kick drum! 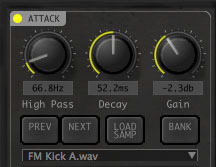 Attack: This section is where you can load your existing kick samples to utilise their attack and character, then tweak the attack settings including high pass, decay and gain. Cycle through kick samples by clicking the previous or next button to instantly audition samples. Body: This is where you’ll find the Tone Generator, allowing you to shape the perfect low end into your kick with detailed envelope, pitch and note parameters. Change the attack, hold and decay times, then alter the pitch settings to create a deep booming sound or something a bit more snappy with less low end. View: See your Kick Drum shape in real time then simply drag the sample straight into your DAW. Set the pitch to match your bass-line, or play the pitch of the kick drum with your MIDI keyboard. VSTBuzz Exclusive: Get Two Extra Expansion Packs Free! That’s right, you’re not just getting 50% off the Big Kick Plugin – you also get 2 free expansion packs worth over €17! Big Kick is a MusicTech Choice award winning plugin. Compatible with both Windows & Mac, it’s easier to use than any previous kick drum design tool with no complex envelopes to set – just sensible knobs for instant results. A built in high pass filter helps you avoid nasty surprises in the sub-bass and clever auto-play settings allow you to click auto-play for an instant kick-drum metronome. Get started jamming without programming a single midi note – for instant kick gratification. Normally €41.99 – get it at 50% off before it’s gone! 50% off the normal price (normally €41.99)! “Big Kick” is the ultimate plugin for creating incredible kick samples for your tracks! A quick a frustration free solution that will save you hours of time! Get to 2 free expansion packs (worth over €17!) along with your Big Kick plugin – Progressive House Kicks with Kiholm & House Kicks V2 with Full Intention! Perfect for all styles of EDM and anything that need a deep beefy kick!